Stand tall, stand strong, stand for Iceland. Strength, respect and pride, the Icelandic national team may as well have been forged in Eyjafjallajökull, their achievements not to be lost in a population stat. The name Georgia Page probably doesn’t mean much to the man or woman on the street although most have seen a viral clip of her. The young rugby player – frequently mistaken for a footballer – is well loved online, a curtailed clip of her spitting out a mouthful of blood and playing on in a match in 2015 usually juxtaposed with Cristano Ronaldo or Neymar rolling around the pitch. Having broken her nose in a challenge, the Lindenwood Lioness dove headfirst into two further challenges, unmoved by her rapidly swelling schnoz or the blood that covered the lower half of her face. Although people are well used to seeing this level of, “put a plaster on it and let me get back on the pitch" hard-noseary from rugby players, Page is a world away from what fans think of when football is called into question. From Neymar’s Razzie award-winning lolling on the pitches in Russia this summer to Ronaldo’s propensity to swan-diving in the box, going down like a sack of Merdacotta at the slightest touch. Fans of women’s football will, however, be quick to tell you that Page is more indicative of women rather than rugby players. Whilst the world will make jokes about man-flu and how women just make do and mend, more likely to suffer in silence as their male counterparts take the week off. Although the histrionics from the men’s side are creeping into women’s football – despite purists claiming that women would never stoop so low as to dive, ask for cards or go in with intent – just getting on with it, is still what women do best. When it comes to pulling themselves off of the grass after being fouled, there are few players who typify the, “’tis but a scratch” Black Knight mentality as much as the Icelandic Dóttirs. The team arguably the most physically imposing in FIFA’s current top 20, their strength comes from their resolve. The weather conditions in Iceland not just not making for the easiest environment to play football in but changing how Icelanders grow up. The conditions are cold and hard, so the players are cold and hard, and they take to the pitch with a depth of determination not to be beaten off the ball. Much like the landscape they inhabit, there is a beauty in the harsh climate they affect on the pitch. 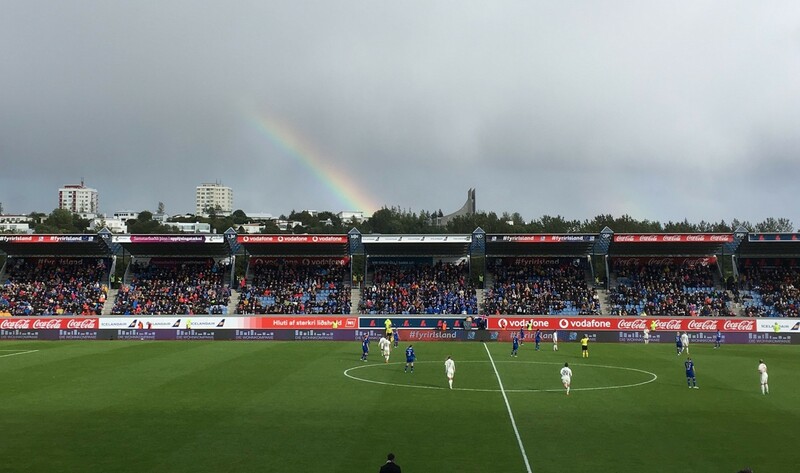 To spend an hour walking through Reykjavík, you’ll so understand why Stelpurnar okkar are the figurative unmovable object in women’s football, the rain is persistent and swirling, the wind constantly whipping the droplets against your flesh. One way and the other, the wind spins around, if you’re not able to plant yourself into the ground, you’ll be swept away. A lot was made of Iceland when Strákarnir okkar qualified first for the 2016 Euros then the 2018 World Cup, the tiny nation romanced by football fans across the world. From the Viking thunderclap to Heimir Hallgrímsson’s dental day job, the world fell in love with the steely Nordic nation. Although the women’s team’s success predates the men’s by seven years - Stelpurnar okkar’s first major tournament an outing at the 2009 Euros - the emergence of the men has boosted interest in the women’s team. The best result for the Dóttirs a quarter-final exit in 2013, their heavy loss to hosts Sweden in Halmstad watched by 7,468, a far cry from the 76,833 fans who watched the men get knocked out in 2016 by the home side in Paris. There is something almost perverse about patriotism when considering how it manifests in the United States and England, how it can drive hatred, base itself in xenophobia and call for misty-eyed days gone. Yet when looking at countries like Iceland, a diminutive nation of well under half a million. Left to float out in the North Atlantic Ocean, detached from Norway, the UK and Canada, the even more diminutive Greenland their nearest landmass. The patriotism, the national pride seems less vulgar, it’s a feeling more of kinship, less about the tundra beneath their feet but more about who they walk through the wind and the rain with. A stubborn opponent that refuses to be knocked down, that will stand tall and use their natural strength to put their opposition on their backs. Though it should be noted, there is little malicious in the style of play; physical but legal, steely not brutish, a consequence of environment. To look at Iceland and marvel at their achievements as a small country is to belittle the work put in by all involved, to take away from the players who would give everything to represent their home. From the captain and most recognisable star in the team, Sara Björk Gunnarsdóttir who is, in her own right, one of the best midfielders in Europe. To reliable shot-stopper Guðbjörg Gunnarsdóttir who consistently stands out as one of the best goalkeepers in Damallsvenskan, or free-scoring Berglind Björg Þorvaldsdóttir. They are players that have been made by Iceland but shouldn’t be defined by their home, their individual and collective talents something for all of Iceland to be proud of, not because they come from a nation of 350,710 but because they are Icelanders. A nation of sons and daughters, of men and women who carry each other through the good and the bad, pillars of strength for each other, their cry a simple one; Fyrir Ísland!